the test nest: What I'm watching these days. What I'm watching these days. It really is the Golden Age of television right now, isn't it? I mean, there is hardly a person out there who can't find a show to obsess over and look forward to each week. My current (and when I say current I mean continuous, of course) obsession is British Dramas. I know we've all jumped on the Downton Abbey train (although I have to inwardly brag that I was there from the beginning, thanks to my PBS-loving grandma)--but what else is going on out there? Many of you have probably heard of the show Call the Midwife. This show follows three young midwives whilst they go about their (stressful!) business in 1950's London. They serve a mostly poor and uneducated population and each episode contains a story line about one or two different moms ready to have a baby. The main character, Jenny Lee, and the show's story line are based upon a real person and real events. The "real" Jenny Lee, Jennifer Worth, wrote about her experiences in a series of memoirs which I highly recommend! I have only read the first, but really liked it. This show couldn't portray women in a more realistic light--the characters are unique, smart, and each have their own talents and flaws. Even if you're not into "birthin' no babies", you may still found yourself drawn into this touching, intelligent drama. I have not failed to shed a tear in the two seasons I have watched. Also, this show introduced my to one of my new favorite actresses of all time, Miranda Hart. She is a British comedian and plays the hilarious and oft sensitive Chummy on the show. If you're already a fan, Season 3 is airing Sunday nights on PBS! 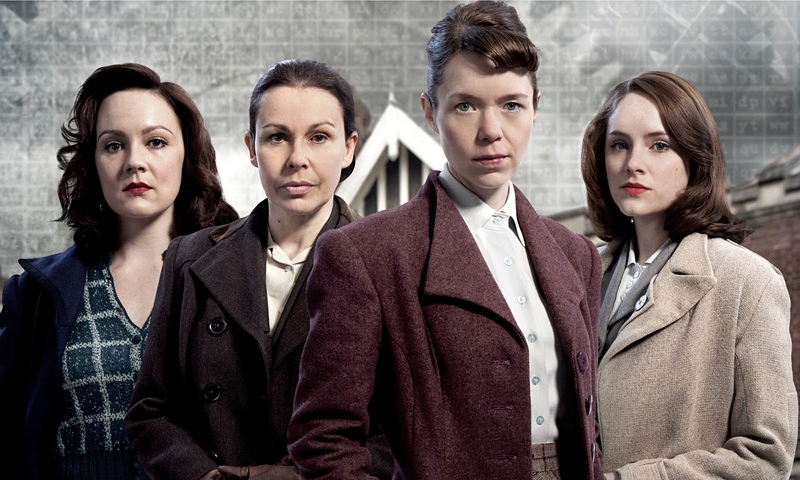 The other show I am currently obsessed with is The Bletchley Circle. There have only been 3 episodes so far, but they are on Netflix and I dare you to watch only one! The good news is, you can watch Season 1 today and then catch second season TOMORROW NIGHT (April 13)! I don't even know how I can describe this show to you to make it sound as interesting as it actually is. The show starts with four young women working in an intelligence office during World War II. It is there job to crack codes and decipher correspondence of the German army. It is obvious that they are incredibly smart ladies and make a difference in the war. Fast forward nine years and we find Susan (the main character) living a rather dull life without a sense of purpose. A series of murders have occurred and Susan is sure that there is a pattern within the murders that will lead to the killer. She gets the old girls back together to help her and what follows is magical!! The four use their code cracking tactics and connections from the war to try and find the murderer. You just . . . have to watch it. Mind you, it's kind of scary, so don't watch it late at night when you're home alone, okay? This list could go on, but I'm getting a bit verbose here, so BBC is the only one getting any love today. What have you been watching?